Constantina Vaseliades, a retired professional ballet dancer, has been in the healing arts since 1980. She began her business Lifeforce ~ Harmonious Healing for People and Pets in 2001 as an Usui Reiki Master Teacher and Ordained Minister and later became a Practitioner of Tong Ren, better known as "beyond acupuncture." Captured by the simplicity of Quantum-Touch and the ability to align the spine, or "move bones" into place with a light touch, she became a Quantum-Touch Instructor/Practitioner and states that Quantum-Touch was the icing on the cake, as it adds strength and more love to all the healing modalities I use. "Constantina is also a licensed massage therapist and specializes in a synergistic combination of therapeutic massage and energy healing arts, together known as "Bliss". Feeling that daily grounding, contemplation and meditation is imperative to our growth and comfort in today's ever-changing earth energy, she felt the need to add a form of the discipline Qigong to her repertoire. To complete the growth and amplification of her advanced energy healing works Constantina is now a Level 3 Qigong instructor and Food-Based Healing instructor with the well-known Supreme Science Qigong Foundation. An Advanced Energy Worker, Licensed Massage Therapist, certified Holistic Health Educator, Multifaceted instructor, and Animal Communicator, Constantina is best known for her intuitive emotional healing and frequency balance techniques, as well as her deep love, compassion and spiritual connection to the earth and animals, saying, "The healing starts as we remember that we are all one." 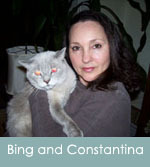 Constantina is at her best while educating, developing and assisting people and pets in working toward a simplistic yet holistic lifestyle. to each client's personal health needs, gently wrapped in Qigong, and topped with daily sunshine or sun gazing. Constantina says, "This synergistic holistic health recipe creates a very sacred place where the balance of yin and yang meets calm, so I call it 'Bliss'." As part of your healing program Constantina also creates a healing pain cream, flower remedies, aromatherapy blends and essential oil;perfumes, perfectly combined to enhance your personal frequency and well BE-ing. Constantina is available for local and long-distance communication, instruction, treatments, and blessings. See Services page for more information. Personal and group instruction in all healing modalities are available upon request. See Workshops page for more information.